Apart from very first one that should be avoided at all costs (cast in part no.2A3509), there is an astonishing five other types generally available. For high-tech ones see 'Flywheels & Pressure plates - technical advances'. Quinton Hazel - Triangular in shape, but only standard-grade cast iron. C-AHT230 - Mini Spares high-grade SG cast iron, but cast pre-lightened. Farndon Engineering - Machined from steel billet. The first two can be lightened, see accompanying diagram. Limit removal of metal on the rear face to 0.120" to be safe, 0.150" if you're feeling brave/lucky. The third can be further lightened by carrying out the machining operation on the rear face as indicated in the diagram and as per previously stated dimensions. Do not remove any more material than indicated for any of these pressure plates as it will not only reduce their strength, but will also cause over-heating of the clutch. Too little material will not be able to absorb any excessive heat generated during spirited driving! Bear in mind what was said about lightened standard cast iron flywheels - the same applies here. 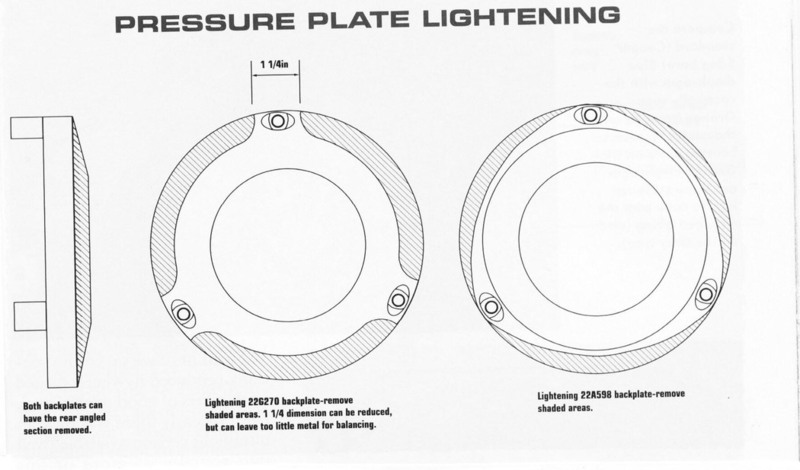 Under no circumstances use lightened standard cast iron pressure plates in ANY competition disciplines. The SG iron items are suitable for full race use despite lightening operations, although further lightening of the Mini Spares C-AHT230 pressure plate is unnecessary.